I still have not showed you the Before & After of my image for week 5! The theme was - as you can probably guess when you look at the photo above - "Hats". I had several ideas and several hats in mind - from a black bowler hat to a sun hat, but in the end decided to go with a more feminine approach which is why I chose my pink girlie hat. I knew quite well what I had in mind and where I wanted to shoot this concept because the concept was among the many sketches I had made for this theme. It was a pretty straight shot to be honest. I knew my pose and took a few photos where I was holding my hands further away from my body and closer to it as well as holding my arms more apart and closer together - just to make sure I had the right pose then later in post-processing. Then I took several photos of the hat in all sorts of angles for the exact same reason. However, as you can see, in the end I had to warp the hat a bit in the end because it was just so wide! 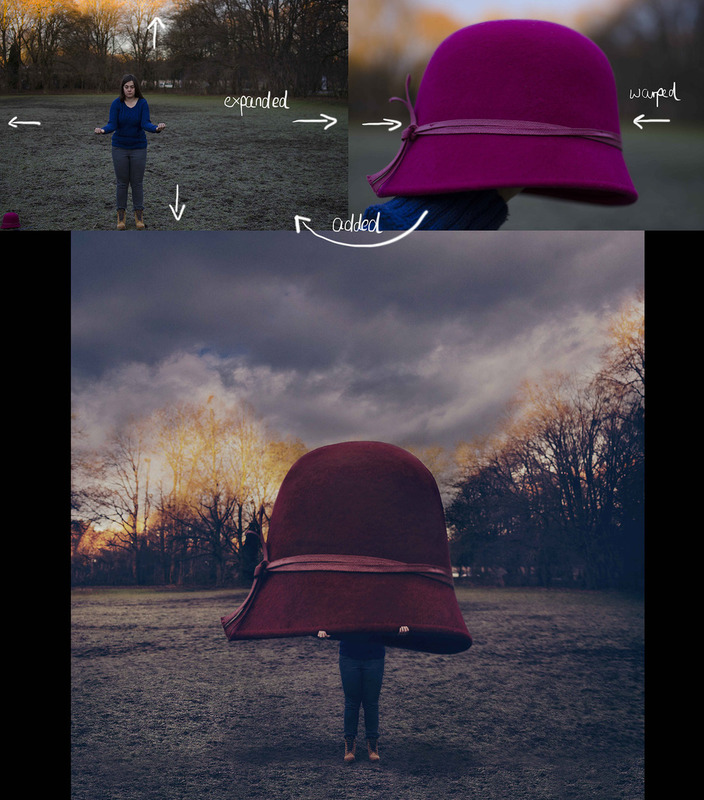 The post-processing included expanding the photo, cutting out the hat, adding a shadow as well as a new sky and then changing lights and tones.